A South African teenager holidaying in Mozambique may well have found part of a wing from missing Malaysia Airlines Flight MH370. The boy made the find in December, and not realising what it might be, took it back to South Africa with him as a souvenir. The fragment has rivet holes along the edge and the number 676EB stamped on it. According to an account in London’s Daily Telegraph, the boy’s mother contacted Australian aviation authorities, who are coordinating the search for MH370. The experts said the number stamped on the part indicates it may belong to a B777, the same type of aircraft as MH370. 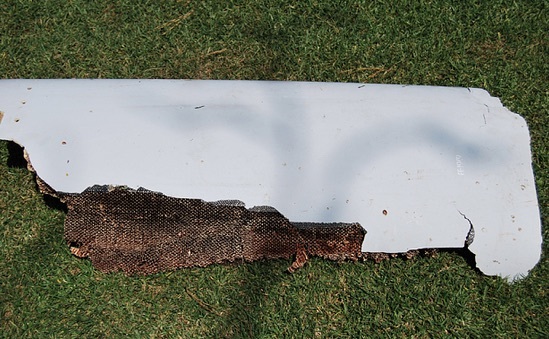 A third piece of debris was reportedly found earlier this month on Reunion island by Johnny Bègue, foreman of the same team that came across a flaperon wing part on a Reunion Island beach last July. The flaperon was confirmed as coming from MH370. See: Lawsuits and tears flow as MH370 deadline nears. The finds have raised hopes that the greatest mystery in the history of aviation may eventually be solved. The original piece of MH370 debris, the flaperon, is the only fragment to be confirmed officially as coming from the doomed aircraft. A second piece, found three weeks ago week off the African coast and roughly triangular in shape, has been brought to Australia for investigation (see: Suspected new MH370 debris to be brought to Australia). Buoyed by the finds, relatives have renewed their insistence that the two-year search for the missing plane must continue beyond this June.